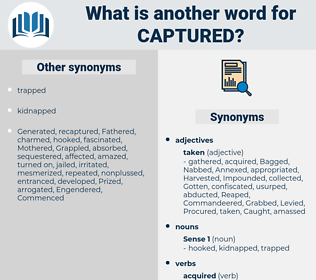 What is another word for Captured? Participated, acquired, Intercepted, Lured, captivated, understood, secured, apprehended, illustrated, accepted, underscored, Attracted, featured, Generated, occupied, occupy, conquered, Reaped, represented, caches, grasped, demonstrated, Introduced, summarized, discovered, reflected, detected, retained, removed, restrained, Grabbed, grabs, deducted, implemented, collected, stole, kidnapped, Enacted, promulgated, Embraced, Reached, summarised, videotaped, learned, Overran, stopped, pursued, identified, Achieved, realized, Prevailed, experienced, produced, recorded, Undertook, taped, highlighted, derived, appropriated, graduated, selected, Carried, earned, received, hijacked, Launched, Scored, broke, adopted, confiscated, hired, dominated, arranged, Garnered, Tackled, addressed, Proceeded, Referred, drew, conveyed, Appealed, assumed, Exercised, Incurred, cast, Instituted, Enjoyed, registered, included, Emerged, Wrote, accessed, Issued, Entered, attained, initiated, curbed, Submitted, checked, engaged, shot, inputs, Gained, used, constituted, committed, raised, Supplied, granted, looted, put, considered, microfilmed, figured, withheld, turned, posed, Upheld, covered, spent, Became, Stayed, pointed, consumed, keeping, kept, Picked, gripped, informed, Were, Accounted, Jumped, attended, clinched, sought, Yielded, Provided, Brought, lost, played, contacted, moved, applied, packed, focused, dropped, contracted, Complained, posted, Served, found, Threw, Nabbed, topped, Filed, stuck, seised, Awarded, tabled, foiled, Dealt, Came, mirrored, filmed, utilized, Chose, ali, Bought, studied, conducted, Flew, saw, showed, controlled, Got, Gave, won, remembered, headed, Took, Logged, thought, Amounted, Wished, Went, booked, Acted, rounded, wanted, Looked, made, abducted, Detained, seized. 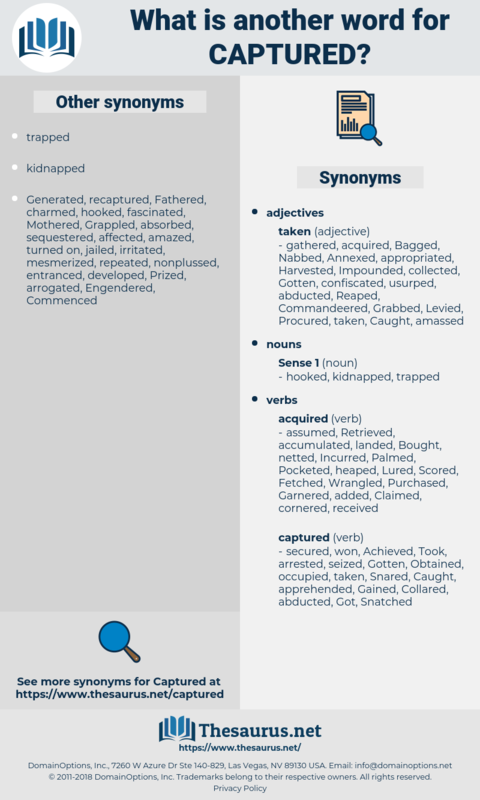 categorized, Participated, Replicated, Extracted, Procured, acquired, Intercepted, Lured, incorporated, captivated, surrendered, measured, expropriated, articulated, reoccupied, reproduced, encapsulated, recouped, understood, secured, Duplicated, apprehended, illustrated, prepared, accepted, perceived, repeated, underscored, characterized, Attracted, recalled, preferred, featured, accumulated, interrupted, Generated, Created, sequestered, information, depicted, Explored, catalogued, Encountered, predicted, Purchased, regrouped, portrayed, Occupying, Attributed, Enumerated, Retrieved, described, occupied, concentrated, conquered, located, Reaped, regulated, Nurtured, Recruited, gathered, implicated, distracted, circulated, uncovered, integrated, Ceased, Assimilated, represented, withdrawn, Appeared, Contemplated, grasped, demonstrated, Introduced, Aggregated, Attacked, publicized, transcribed, summarized, discovered, accrued, reflected, consolidated, restricted, regained, evaluated, detected, retained, removed, restrained, presented, ignored, Targeted, Enunciated, tracked, projected, inspired, destroyed, stolen, reported, Grabbed, treated, exploited, characterised, Indicated, correspond, deducted, kidnaped, implemented, collected, overwhelmed, Transferred, Translated, Equated, elicited, kidnapped, Investigated, Enacted, insured, promulgated, entrenched, Embraced, terminated, Accommodated, revealed, Learnt, stricken, Reached, uptake, summarised, Succeeded, relieved, Collated, allocated, Administered, pronounced, established, learned, delineated, Tricked, accomplished, stopped, Migrated, formulated, affected, imprisoned, stimulated, synthesized, transformed, pursued, identified, practised, leveraged, documented, restated, activated, provoked, referenced, Achieved, impressed, Tabulated, processed, realized, accompanied, Inspected, etched, Delivered, seduced, mainstreamed, Undertaken, Gleaned, experienced, produced, memorandum, Construed, cleaned, dedicated, excited, recorded, Inserted, taped, highlighted, derived, Subjected, afflicted, appropriated, diverted, Confronted, charged, selected, called, preserved, fired, Carried, tapped, earned, Apprised, exposed, mastered, released, ingested, recognized, beaten, credited, Tempted, broken, contained, received, Deleted, enthralled, hijacked, aroused, permitted, Launched, Scored, stored, specified, encumbered, emphasised, transmitted, designated, cleared, suspended, recognised, emphasized, saved, reunited, organized, Caused, Inventoried, adopted, reprinted, netted, confiscated, hired, triggered, dominated, clustered, Screened, Fooled, registrable, restarted, arranged, engraved, Comprised, cherished, realised, frozen, proven, Ascribed, forfeited, inputted, estimated, Influenced, wired, Borne, travelled, absorbed, valued, Managed, Tackled, addressed, Compiled, drawn, Prompted, discontinued, Rendered, scavenged, evoked, Embarked, harnessed, revived, Referred, sparked, observed, Appealed, Scanned, attached, awakened, assumed, Exercised, reconvened, Incurred, connected, labeled, labelled, Remitted, elaborated, touched, governed, Reckoned, Relied, Forwarded, Occurred, written, cast, expressed, uploaded, Instituted, Enjoyed, prescribed, assembled, printed, registered, Resulted, Benefited, Responded, delayed, included, Emerged, agreed, recommenced, accessed, determined, budgeted, stamped, fed, envisioned, nominated, Issued, Displayed, mired, Approached, merged, Entered, fulfilled, attained, Exemplified, struck, input, initiated, nourished, overlooked, disposed, Engendered, Dragged, classified, Submitted, Regarded, checked, engaged, Killed, Cited, Echoed, inscribed, shot, Gained, used, desired, Spurred, noticed, embedded, committed, imposed, conserved, Mentioned, raised, Told, renewed, Quoted, Performed, offset, Manifested, framed, granted, confined, broached, finalized, put, eaten, requested, paid, considered, Knocked, disclosed, heard, Surveyed, faced, Assessed, Arraigned, hunted, maintained, outlined, thrilled, become, amassed, withheld, defined, monitored, turned, graded, deferred, keyed, posed, Upheld, burned, concerned, covered, noted, Riveted, subsumed, pledged, pointed, Taxed, consumed, embodied, kept, Picked, psyched, Rated, spotted, Debated, expended, Demanded, Disbursed, Replied, Invoked, laid, ranked, grouped, enclosed, Towed, informed, enrolled, enroled, reviewed, Audited, Garnisheed, sampled, adsorbed, assigned, fostered, Passed, placed, foreseen, engrossed, Accounted, attended, Examined, halted, Stormed, Begun, Enshrined, surrounded, garnished, focussed, stranded, sought, Yielded, Provided, Brought, Been, evidenced, opted, Punched, played, tested, limited, contacted, moved, added, applied, programmed, packed, risen, focused, Returned, dropped, Levied, satisfied, Fished, copied, contracted, Complained, Adduced, lifted, rebounded, Boarded, salvaged, reserved, fuelled, led, posted, Served, sent, admitted, found, Visited, Accorded, quit, Deemed, Flagged, allotted, Nabbed, honoured, built, combined, Earmarked, fallen, mistaken, Resumed, Counted, Envisaged, Waived, Filed, witnessed, stuck, locked, Weighed, grown, come, seised, Awarded, tabled, Availed, Indexed, resolved, Met, busted, Convened, shouldered, Viewed, stated, Notified, chosen, vested, Dealt, advised, filled, pulled, involved, divided, mirrored, Likened, Consulted, rolled, utilized, Claimed, Discussed, loaded, owned, seen, Lagged, ali, Consigned, Bought, intended, planned, missed, party, voiced, studied, taken, Lodged, marked, Shown, cornered, Gotten, landed, have, Has, listed, blocked, handled, given, kicked, controlled, Grounded, Housed, angled, Got, scheduled, Impounded, won, CODED, Classed, licensed, HIT, pumped, remembered, headed, tuned, Logged, Pooled, Asked, Bagged, sorted, typed, thought, Bundled, signed, gone, handed, Wished, booked, Acted, rounded, folded, trapped, Looked, Numbered, dated, made, done, named, arrested, abducted, Detained, seized. To be captured meant defeat, utter and final dismay. She took one prize and was captured.